This post is part of our series on measurement tools for social media analytics. Twitonomy is an online Twitter analytics tool that is meant to provide the Twitter user with dynamic statistics. The tool doesn’t make any promises (a very smart move), and doesn’t tout any bells and whistles you can’t at least preview with the free account. So I decided to demo their free package and review my experience. Was it worth my time? I typed in www.twitonomy.com and hoped for something less complicated than the previous analytic sites I’d perused. This is what greeted me. Screenshot of twitonomy's home page. My first impression of the site: Simple. Almost too simple. But, it’s the perfect amount of bait. Just by looking at this home page I assumed Twitonomy’s goal was to appear smart and easy-to-use to both novice Twitter users and social media ninjas. There are no questions or qualifiers to fill out as you click Enter, just a request to sign into Twitter. Some people think of analytics and cringe, but this home page reassures the viewer that nothing but smooth sailing is ahead. My account connected seamlessly, but the relieved smile on my face quickly faded as the page loaded. The opening screen is busy. I skim over the amicably toned text and brush aside the yellow upgrade button. Thoughtfully, Twitonomy starts you off with two streams to monitor at the bottom of the page—your Twitter home page (your tweets), and your Twitter feed (the tweets from accounts you follow). Twitonomy also offers the option to pull feeds from other users, lists, or searches--a great feature for a free service. But I couldn’t help being drawn back to the top portion of the dashboard. Twitonomy offers many features, such as the “Followers Report", which promises to give the user “actionable insights,” by providing profiles of followers: their scope of influence or reach, their preferences/interests, their tweet locations, and more. This feature alone would make me upgrade to Twitonomy Premium. More debut features (shown below) include “Track”, “Search Analytics” and data download privileges (all data download to Excel and PDF documents). On the Dashboard, access to in-depth stats about my account are either Premium Only, with limited information for free accounts. This made me want to upgrade to see what I was missing. One of the free measurements (found on the right side of the dashboard) was a link titled “Analyze Twitter Profile.” This link opens to a smorgasbord of data. In the “Tweets Analytics” box located on the left side of the screen you find brief details of your account: how many retweets, tweets per day, hashtags, mentions, replies, links, and so on. This info is drawn from the timespan between your first login on Twitter to the present day. Clicking on an orange button that says “Modify range” allows you to change the parameters for a more focused report. However, if you are a free user and you try to mess with the date parameters of this analytical assessment, guess what greets you? The happy yellow upgrade button. I chose to keep the preset dates and kept scrolling. 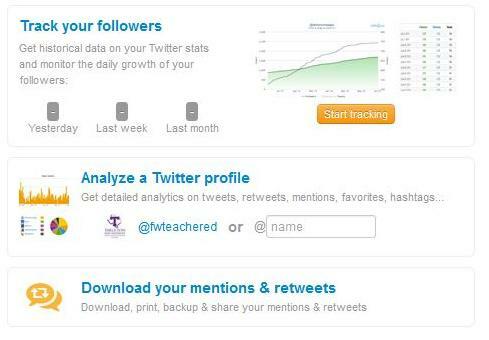 Twitonomy gives you lots of graphs and charts, which is a major plus for novice users. A line graph accompanies your tweet history; an array of pie charts with vibrant colors display account analytics concerning the users you retweet the most, etc. Following the Yellow Brick Upgrade Button. Is it worth it? Absolutely. Twitonomy allows you to download and keep all the data it provides you. Free Twitonomy users have limited download abilities. With the upgrade, you’re able to assess and view the data in Excel spreadsheets or PDF documents. Another important feature of this option is the Follower’s Report. As mentioned before, this tool could be leveraged by any user wishing to expand social network opportunities and possibly increase ROI on social media campaigns. The reason being this feature offers valuable insight on follower demographics and characteristics, one of the major reasons why analytics are conducted. Lastly, these measurement tools can easily offer answers to most social media marketing key performance indicators (KPI). The upgrade is worth the low cost. A 30-day test run of the premium package runs you $20, no strings attached. One thing I am concerned with is the tool's lack of emotional assessment. An analytics tool that can’t provide sentiment analysis isn't helpful for brands wishing to expand reach. Not knowing how your audience feels about your posts keeps engagement low. (If you’re interested in basic sentiment assessment, try tools such as Tweet Sentiment, and SocialMention). Twitonomy is one of the perfect places to start for basic analytics. The tool gives you a surprisingly robust array of data visualizations and information. However, its limitations can be quite frustrating, and would most likely push you to upgrade. Still, for free you’re getting high-quality stats and useful information. P.S. Check out the brain behind Twitonomy. Amara Oji is a graduate student at Tarleton State University. You can contact her at @TheRealAmaraOji on Twitter. The Texas Social Media Research Institute (TSMRI) is a group of faculty, staff, and students at Tarleton State University with a mission of conducting social media research; sharing social media best practices; and providing social media education for students, non-profit organizations, state agencies, school districts, and higher education institutions.